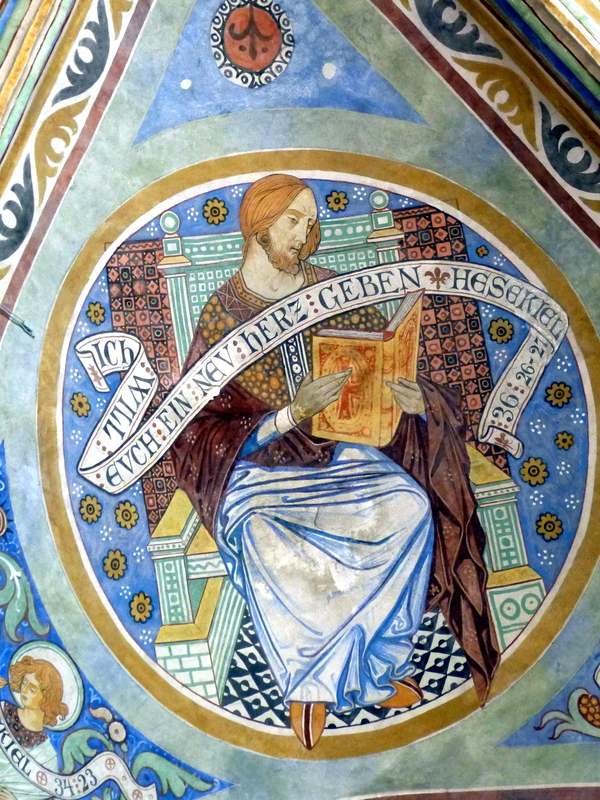 The Prophet Ezekiel, “Bergen Marienkirche – Fresko Propheten 2a” by Wolfgang Sauber – Licensed under CC BY-SA 4.0 via Wikimedia Commons. You are the daughter of your mother, who detested her husband and her sons, and you are the sister of your sisters who detested their husbands and their sons. . . . Have you not copied their behavior and practiced their abominable deeds? In a short time you became even more depraved in all your conduct than they were! As surely as I live, declares the sovereign Lord, your sister Sodom and her daughters never behaved as wickedly as you and your daughters have behaved. In short, ouch. This is an important passage about wickedness–one well worth thinking about, especially since Ezekiel is about to explain that the sin of Sodom, which Jerusalem has outdone, was “pride, fulness of bread, and abundance of idleness was in her and in her daughters, neither did she strengthen the hand of the poor and needy” (Ezekiel 16:49, KJV). But, again, note that the entire point of the passage is that they have gone beyond the wickedness of their neighbors. What this passage is not about is “the importance of a mother’s example,” which is how the December Young Women’s lesson on preparing to establish a Christ-like home tags it. In the first place, Ezekiel’s point is that the proverb is not true because they have exceeded their “mother’s” example. Second, it is most clearly a negative example–not a positive one to be emulated. Third, it seems that “the kind of people who like to quote proverbs” are not exactly the good guys in this story, but rather the kinds of enemies one acquires when one acts poorly, so we might not want to repeat their taunting proverb. Fourth, the mother is an allegorical figure for their neighboring nations–not a literal mother by any stretch (the Institute manual explains this clearly). When I was investigating the church in the early 90s, all of the sister missionaries who taught me presented a sentence or two of context before sharing any scripture. I have no idea if this was an idiosyncratic, local, or church-wide practice at the time, but it was the right thing to do. They would always begin with something like “Shortly after Jesus was resurrected, he visited the New World and taught the people that . . . ” or “Lehi was a prophet who lived hundreds of years before Christ and told his wayward sons that . . .” or whatever. It is a necessary discipline to be aware of the context in order to be sure that we are accurately reflecting what the scriptures teach and not proof-texting them. If you can’t imagine yourself telling the Young Women, “Ezekiel was comparing the people to a prostitute because they were following other nations and he warned them that . . . ” then you shouldn’t be using this passage to make your point. This lesson engages in the kind of acontextual reading that has become all too common in our era. I suspect that this kind of thing is one of the dangers of relying on computerized keyword searches–perhaps the case with our use of Moroni 9:9 as well–but I can’t be certain. I find it ironic that the point of this lesson is the importance of examples when the example of the lesson itself is one of wresting the scriptures. So, if you are Correlation, you write the lessons you are told to write, then do a computerized key word search to find some superficially relevant scriptures to throw in. Thus we see how the topic selection and points made in lessons, even in the Standard Works-focused curriculum in Sunday School, have so little to do with actual scriptural themes or concepts. and oh my goodness, can you imagine a teacher with no teaching experience or skill in reading scripture (let alone one that has not studied or read the scriptures apart from the assigned lesson verses) having to teach that lesson? that is scary. But didn’t the New Testament authors do the same thing? Appears that they often used Old Testament sources horribly out of context. A text without a context is just a pretext for a prooftext. “But didn’t the New Testament authors do the same thing?” Yes, and we could have an interesting discussion about whether, given their cultural situation, that was or was not an appropriate approach. (And it is worth noting that not all NT writers did it or did it to the same extent: Matthew is shot through with it, but Mark not so much.) We can’t have that same debate today, where there is no debate about whether it is appropriate to read contra-contextually. Gander, I think the New Testament authors and those that gave new expression for the NT over its long history knew exactly what they were doing. Matthew and Luke were even said to have softened some of the things Mark said. Sometimes I get the impression that what they really mean by no outside resources includes the scriptures not specifically referenced in the manual. This reminds me of the Wizard of Oz. Frank L. Baum wrote a children’s story, with no hidden messages. But some university professors wanted to find some hidden messages in it, and wrote articles on how the Wizard of Oz was an argument to keep the U.S. currency on the gold standard (keep on the yellow brick road, etc). A few years later F. L. Baums daughter (after hearing the nonsense) dug up some old news papers articles where her dad argued against the gold standard. The professors response was that a reader is supposed to get out of the text whatever they want to get out of it, regardless of what the author wrote. In University I was in similar conversations with Humanities majors, or the Humanities grad students who were teaching the courses I had to take. I would say that the author wrote these words, and they meant these words. I would then be ‘corrected’ and how a good reader can read in between the lines, discover hidden meanings, and can get from the text whatever they ‘feel’ like getting out of it. The words are just a catalyst for a deeper spiritual journey, or something like that. It sounds like you’re being as equally narrow minded as myself, by limiting the words to just what the author intended them to be. That’s not being very open minded. Julie, the practice of contextualizing scriptures when teaching them was part of the “Missionary Guide” pedagogy taught to missionaries in the late 80s and early 90s. So, it was certainly institutionalized. I don’t believe these themes are appropriate for young women in any context. This is both embarrassing and sad. Darn, I always thought that backstory about the Wizard of Oz was true! I recently had an online discussion with a woman who wanted to find a “family friendly” (in a completely different sense of the phrase than we usually use it) world history book because the books she had been reading made it sound as if women had been oppressed throughout history and that didn’t match what the church taught about the importance of women and families. Another time very recently I sat through a women’s Old Testament class where the participants tried to make Leviticus family friendly (again, with that other meaning) and compliant with current LDS church practice. I wish I’d known how good I had it in my first religion class at BYU where I was taught us the Old Testament as the Old Testament, not as a Mormonized document. The Wizard of Oz was a children’s story, but colored with Baum’s political experience. It’s very possible that he had used the term “yellow brick road” before he wrote it into the story. So how do we stop the proof-texting? Does there need to be a fact-checking entity that calls these out? Here is another example of an embarrassing proof-text. When I was teaching Sunday school to the youth a few years ago there was a lesson titled, “How can I improve my scripture study.” One of the themes was “If we seek, we shall find.” It cited Isaiah 34:16. The KJV passage they wanted you look at reads, “Seek ye out of the book of the LORD, and read.” The problem is that the rest of the verse continues with, “no one of these shall fail, none shall want her mate: for my mouth it hath commanded, and his spirit it hath gathered them.” It isn’t referring to improving your scripture study, or searching the scriptures to find answers, or even to humans. Isaiah 34 is about the destruction of Edom and how wild animals will forever inhabit the land. Is that how we want to teach the youth to improve their scripture study, by taking phrases out of context? I had my class read from the Contemporary English Version (CEV) along with the KJV so that they would have some comprehension of what they were reading. Here is the CEV translation of Isaiah 34:16 and its footnote. So contrary to the theme of the lesson, it turns out that you can’t search and find where it is written, because no one knows what book it is referring to or where the quote comes from. Julie – I love your writing and insights. In this case, I’m not sure I am in full agreement. Most proverbs are stand-alone statements – there is no real narrative context for them. Furthermore, this particular proverb is not found in the book of Proverbs or elsewhere in the scriptures – it just happens to be cited in this allegory from Ezekiel. Even though Ezekiel happens to be using it for a different purpose, is it really all that problematic to cite its only canonical location? After all, it could be argued that Ezekiel is using it more out of context than the “Come, Follow Me” lesson. Religion has always been a process of assimilation and adaptation. The early Christian writers were re-contextualizing many Old Testament verses just as the Jews had done prior. Julie’s example however, is not a re-contextualizing of the verse in the broad methodology of “likening the scriptures unto us.” Indeed, the context of the verse is almost the exact opposite of its utilized application. If you are going to liken the scriptures by changing their meaning to mean the opposite of what they say, this is not sound methodology but intellectual laziness. And intelligence is a subset of spirit. The upside to the “likening” approach is everyone can participate. This is great, and I think the only general approach a world wide church can take to allow for the diversity of culture and opinion. The danger with this approach is going beyond the “likening” and instead “sterilizing the scriptures to make them look like us.” You can reinterpret scripture for a present application, but rewriting history to justify your interpretation is not methodologically sound or intellectually honest. We must simply admit what we are doing. The problem is so many members have no idea that their interpretation is a re-interpretation. I think Julie is just asking for a little more open-doored awareness and honesty. Such an approach is fraught with peril simply because it makes application and interpretation entirely arbitrary, and in an authoritarian culture like Mormonism, entirely up to the manual writers. Additionally, such an approach is methodologically different than any other kind of re-contextualization that has been done. Ancient writers did have to go through the text and wrestle with it even as they were re-applying it. On a digital screen, no wrestling is required, which means no thinking is required. The problem is not proof-texting, but electronic proof-texting, which eliminates the need to bother with the text at all. Not only can you not translate the gold plates with an I-Phone, but I’m beginning to think that you cannot read the translation with one either. The simplicity and ease of it takes too much of a toll. This is not the Church’s fault. This is the sign of the times. Perhaps Correlation has considered this? Julie’s example, however, shows that, at least in part, not-so-much. John, couldn’t he have? When I think of Joseph Smith and the seer stones he used for interpretation, I think of the translation functions found in my smart phone. The difference, of course, between using an iPhone to prooftext is that instead of looking *at* the phone’s surface content, when I use my phone to translate, I’m using it as a tool to look through, and it is superimposing meaningful suggestions on top of the text that I see through it. We can study the scriptures by capturing only the seminary “mastery” portion on the phone’s screen, or we can scroll up and down and read the rest of the text. Use the search functions to cross reference, or the wider searches to look at different translations. The tools are all there to escape thoughtlessness. We ought to use them without the twitter mindset for better results. Is that your point? If so, I think I can attest to seeing some glimmers of hope from the correlated Church program. It’s not found in the youth curriculum, it’s in the meme videos they’re publishing, which occasionally show people using technology to enhance person to person experiences, contrasting that with the thing you’re describing. It’s interesting to me that both forces are at work in the correlated institutions under the Church umbrella. Ironically, I was just working again on my YW lessons for December and came across this “Teaching Tip” in the margin: “When we quote scriptures, we should ensure that our use of them is consistent with their context” (Teaching, No Greater Call , 53). There are actually quite a few references in Teaching No Greater Call, and other official and General Authority writings about the importance of context. There’s a famous story Elder Packer told about misquoting a passage. Only last Friday while putting together some things for a presentation, I read part of it to some brethren from BYU. I noticed they looked at one another at one place in my reading, and I stopped and asked if there was a problem. Finally one of them suggested that I not use a certain scripture that I had included even though it said exactly what I wanted to convey. How dare they suppose that a member of the Twelve didn’t know his scriptures! I simply said, “What do you suggest?” He said, “Better find another scripture,” and he pointed out that if I put that verse back in context, it was really talking about another subject. Others had used it as I proposed to use it, but it was not really correct. I was very glad to make a change. But this emphasis (and the complexity that results from looking at context) doesn’t seem to get into the church curriculum, either in the teaching or in the modeling of how to study and interpret. The left hand doesn’t know what the right hand is doing. That said, I do agree that it would probably be better to make known the original context of the verse. Ben S. and Julie, I think Teaching: No Greater Call is an amazing resource. To follow its suggestions, though, you kind of have to disregard most of the other lesson manuals. If I remember right (I haven’t read it in a few years), it has a great part about asking good questions, too. I always found it ironic that the recommended questions in other manuals go against almost all of those suggestions. But it makes me optimistic that at least some people involved in the curriculum creation process are on the right track for making great lessons a little easier to prepare. Agreed, mirror. I was SS President and taught the teacher improvement class a while back. I discovered T:NGC had some surprising things in it, like authorizing you to “hijack” the class when the teacher’s not doing a great job. “Teaching: No Greater Call”? That is so, like, last century. I remember the first time this proof-texting point was brought home to me. We were teaching a discussion to a twenty-something man on my mission. He was rather deeply immersed in online vampire games/forums, and the only part of the lesson that he really appreciated was a verse from Alma about the resurrection (which one escapes me). His reaction was aesthetic — on its own, he felt it expressed for him the same sort of aesthetic he appreciated in his vampire hobby. And he really really loved it, asking us for a copy of the BofM and marking the passage. He then asked us if we could find more scriptures like that for him. It was clear he wanted to use them in the same way that Latin and other scriptural passages sometimes get used in vampire movies/art/expression. I was disturbed and very unsure whether I was willing to find any further verses for him. I can’t remember if I was self-critical enough then to think about my own use of the scriptures. I was talking with a friend recently about T&S and how it differs from other sites, such as BCC. It took me a while to understand that the main difference is: the permabloggers. Julie Smith: your insightful, smart, spiritual, feminist, faithful, and carefully critical posts are the main reason that I check into T&S daily. Sometimes you go missing for weeks. Two recent posts give me hope that are still engaged with this. Thanks so much. Of course I have no idea how Joseph translated the plates, let alone how the Urim and Thumim works (or the rock in the hat). An IPhone accesses an online database that helps translate, but the help tools are entirely didactic and pedantic. I should imagine that the tools given Joseph were not that, as he had to struggle with the translation using imaginative and intuitive leaps. Indeed, it appears no else could translate the plates, and if it was simple IPhone technology, you would think that anyone would be able to translate. People can of course read the entire text on their screens. It’s just that few actually do. Reading has always been an arduous affair, and by no means biologically programmed into the psyche. Studies show that most people do not read another book after high school or undergrad. The Church itself is producing more videos than books to update their approach. One of the great traditions of Mormonism has been its strong emphasis on scripture study. In the past this was a fully literate process. One had to tangle with an archaic text and analyze it. A literate approach produces literate commentaries, and Mormonism produced Jesus the Christ and Mormon Doctrine as a way to interpret these archaic texts. While not a fan of either of these books, it does show considerable reading and thinking on the behalf of those authors. Today’s manuals are a completely different animal, they are bullet-pointed, thematic, and cursory. They lend themselves to proof-texting, and especially electronic proof-texting, which is the worst of both worlds. The thing is, they need not do this. A rough outline of a lesson allows for an instructor to prepare wide and deep if needed. The problem is, at least in my neck of the woods (Utah County), most instructors either cannot probe wide and deep, or worse, are not allowed to. In multiple wards I have heard the formal and approved approach is to stick strictly to the manual, do not deviate from it, and that the purpose of Sunday School is not historical research or learning but feeling the spirit. In other words, these loose outlines and sporadic scripture citations of the manuals are being followed as if they are scriptures themselves. It is bizarre and strange, and produces, oft times, underwhelming if not spiritually sterilizing results. What irony. Well, I suppose we have always struggled teaching the scriptures in some way to a population who really does not read them. There are some who do, and some who take passion in their study (Julie and Ben, for example, and probably lots of people on this board.) The passion of reading will always be opposed to the plethora of correlated bullet-points and proof-texts. As a result, there will be many more posts like this one…. Issue ultimately is what gets emphasized more. Using scripture or understanding scripture contextually. I think if the scriptures are a tool to be used with inspiration then (1) will always be dominate. As it should be. That’s not to deny that we shouldn’t also look at scripture in context but it’s really a tool. Along those lines this remains my favorite talk on the subject. Today’s manuals actually reflect the possibility of a much more flexible approach to gospel teaching than previous manuals did, in my view. The quality of it really depends on the teacher and her context, though. If things really are as oppressive as you describe them in Utah County, then my sense is that something is more wrong with church environments in Utah County than with the sparseness of the manual. I think it possible to wield the passage in its context, by the way. Simply put, hijack the correlation. And then off the discussion can go, right? I have a good example of manual prooftexting. A long time ago (before the current teachings of the prophets-type manuals) the priesthood manuals were simply topical in structure. And I remember one with the title “Become a Distinctive People,” keyed to 1 Peter 2:9: “But ye are a chosen generation, a royal priesthood, an holy nation, a peculiar people.” I could see what they were doing; they were focusing on the expression “a pecuiar people,” but then giving it a less potentially negative spin (IE “weird, “strange”). And the lesson goes off on that track, of how we can become a “distinctive” people. Rob, the problem is that the prophet Ezekiel doesn’t use the proverb–he quotes other people using it and concludes that they are wrong. If you forced me to use this passage in this lesson, the best I could do in contextualizing it would be something like this: “Ezekiel said that this proverb was wrong, but do you think it could be true in other situations?” That’s kind of a weird teaching approach though–like quoting Korihor and asking if what he said might fly in some other context. Ezekiel doesn’t say the proverb is wrong (so far as I can tell). He says they’re spot on when they say, “like mother, like daughter” because the corrupt daughters are just like their corrupt mothers. If, however, Ezekiel does conclude that they’re wrong in using this proverb it’s only in the sense that it isn’t descriptive enough — they’re sins are way beyond anything the daughters/sisters/mothers of neighboring peoples were known for — but the irony is still intact. Yeah, I see your point, Julie. The best you could do is bank-shot it but also truthfully say he was using it critically. Or, my instinct would be to just begin the discussion with a different scripture and just make preparations to fully answer the question about Ezekiel if it came up. Kind of like that time I told my seminary class that the Priesthood policy existed because Church leaders and members in the 19th through mid-20th century were largely white-supremacist racists, just like the preponderance of white Americans; I primed the discussion with the trajectory I wanted and then waited for the question. I agree that the manuals do offer a much broader approach if used as what they are–outlines. Sadly, many wards in my area do not seem to comprehend this. When I teach, I do hijack correlation. After all, if the point of Sunday School is to feel the Spirit, then it’s good to know that the Spirit cannot be correlated. One more point. Consider this. What do we think when our particular political opponents (left or right, whatever you are) reinterpret the Unites States Constitution or criminal and civil statutes into whole new areas by changing the original meaning of said laws and statutes? How do we interpret the law, and does the historical reason for its establishment and traditional interpretation from that establishment matter? I cannot imagine a sane person saying no, but it turns out that the laws are being refashioned, revisioned, reformatted, and reinterpreted, oft times through spurious, politically motivated arguments that utilize some legal examples over others. In other words, the legal code gets “proof-texted” in an attempt to change the meaning of the laws. Is that right or healthy? When and how? And if it can be so dangerous with the law, then why not the moral law in scripture? You can argue modern revelation as a basis to proof-text, just as lawyers argue modern context overrides historical precedent. Words matter. Context matters. History matters. And the only moral and rational way to alter the words, the context, and the history, is to know them in their original setting so you know what you are changing, what you are gaining, and what you are loosing. Sometimes I think God sits up in his heaven and looks down at us and laughs at all the silly ways we try to twist obscure scriptural texts to fit our preconceived notions of his truth. Prooftexting and quoting passages out of context can certainly have its issues, but I’m not sure that this case is as egregious as you are making it out to be. This is the only source of the proverb; proverbs can be used in many contexts, and it doesn’t have to be limited to the exact way in which Ezekiel is using it (as an indictment against Jerusalem). Just like the similar and familiar proverb, “like father, like son,” it can be used both positively and negatively. *Typo – “parable” should be “proverb” in my first sentence. You read that as “true and then some,” but I think in context, it is showing the proverb to be wrong. Not “mother=daughter” but “mother>daughter.” The > doesn’t mean = and then some. The > means that = is the wrong description of the relationship. But let’s say, for the sake of argument, that I agreed with your reading that Ezekiel agrees with the proverb “and then some”. I still have a problem with the idea of taking a proverb about a symbolic mother’s example of symbolic prostitution and using it as an example of a literal mother’s example of righteous living. It’s just too far divorced from the canonical usage of the text. There are plenty of other stories about righteous mothers that can be used without wresting. Agreed – there may be more direct examples that could have been used. And I don’t mean to continue to split hairs. But :) . . . note that the “way way worse than” passage you are referring to in the text is referring to her sisters, not mother.